This month has remained mostly hot and dry. Woodbrooke’s wildflowers have suffered as has the lake. 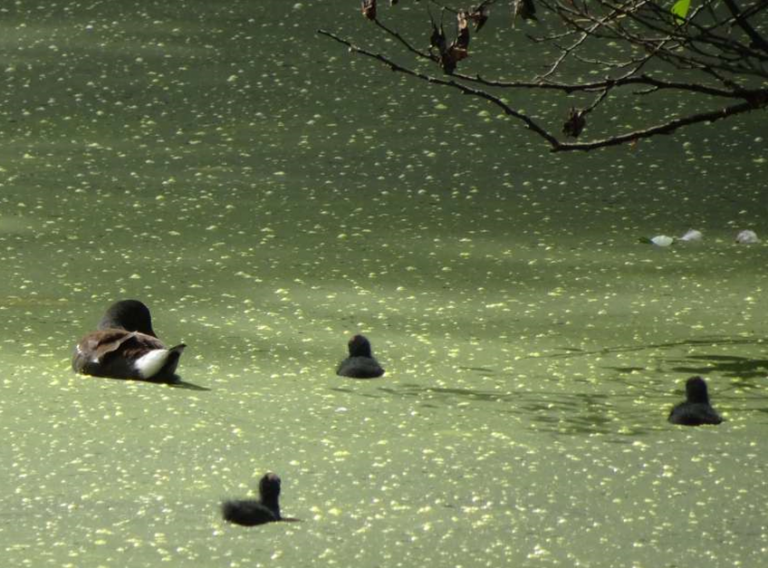 The water quality in the lake has apparently been damaged. The level has been low. Often it has looked soupy with algae. The effects of evaporation and have been aggravated because the level not been topped up by the Wood Brook stream flowing to the south of the site. This has a low flow itself. The weir of the stream that allows some of its water to flow into the lake has been damaged and this has prevented any chance of topping up the lake. 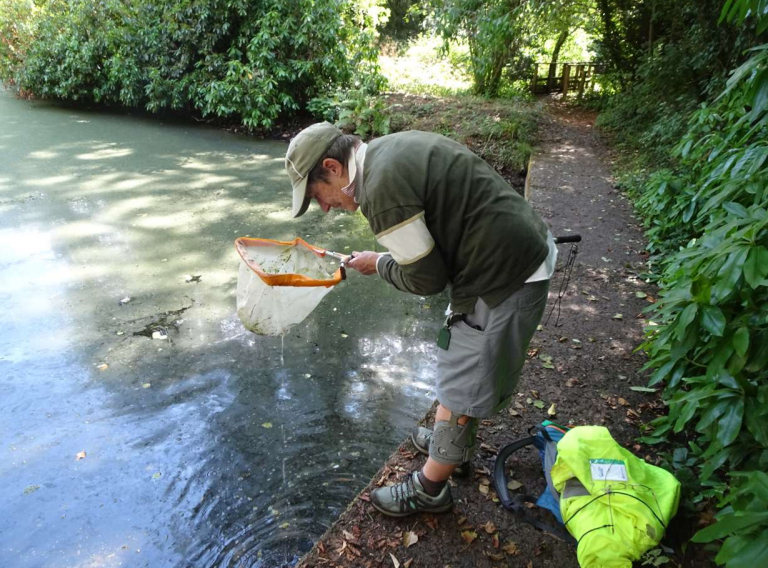 I planned some time ago to look at what creatures could be found in the lake and the stream but, in practice, my survey on a hot day, 21st August, seemed to be rather about confirming how poor the biodiversity has become. 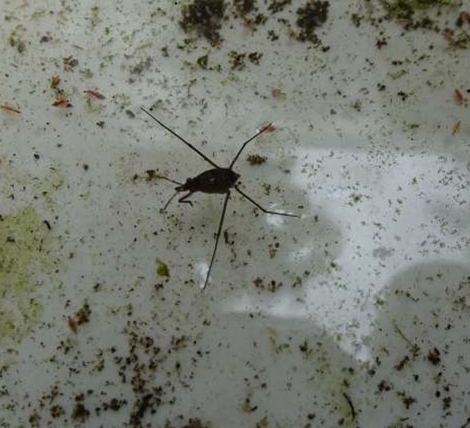 At my sampling spots, I did 10 sweeps with my net and checked what animals were captured. I sampled the stream by the bridge and the lake at 2 points. One of the concrete dam and one at the spot where the water could overflow back to the stream if the level were high enough. The stream at the bridge had clear water, a stony bed and no vegetation. 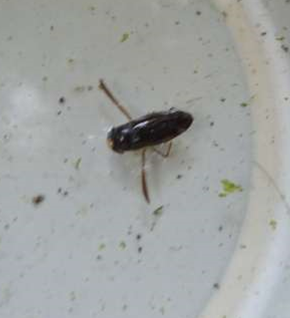 It hosted some three-spined sticklebacks together with a small snail, some Asellus (water lice), a leech and two three-tailed nymphs which I guessed could be a mayfly larvae. 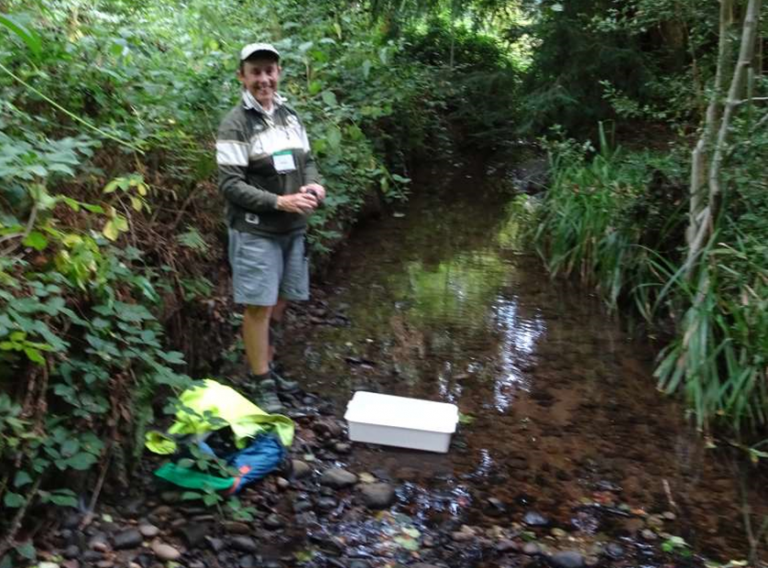 Sampling the Woodbrooke stream near the bridge and the lake from the dam. The white tray is used for examining the specimens. 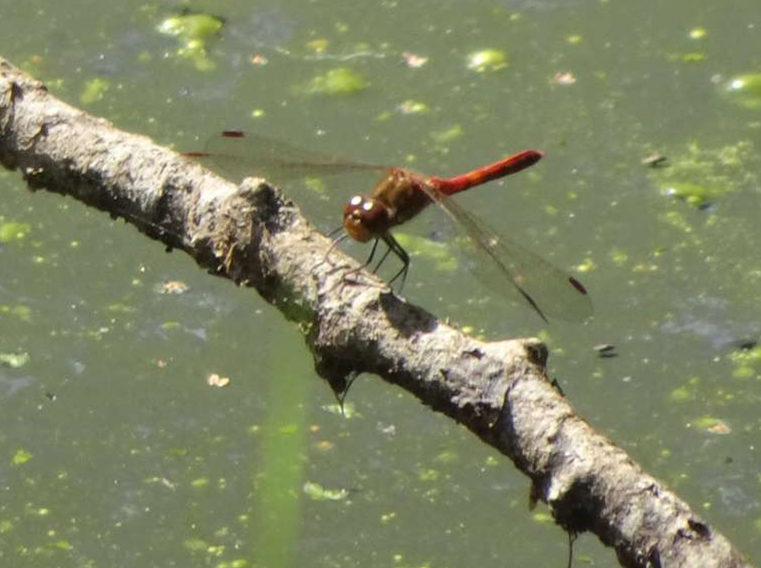 A large red damselfly is not disturbed on its twig above the lake. 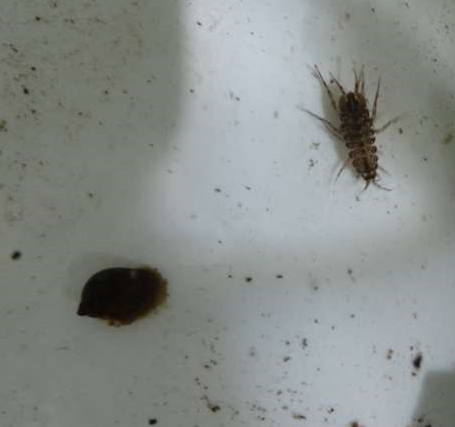 Asellus and a snail from the stream. 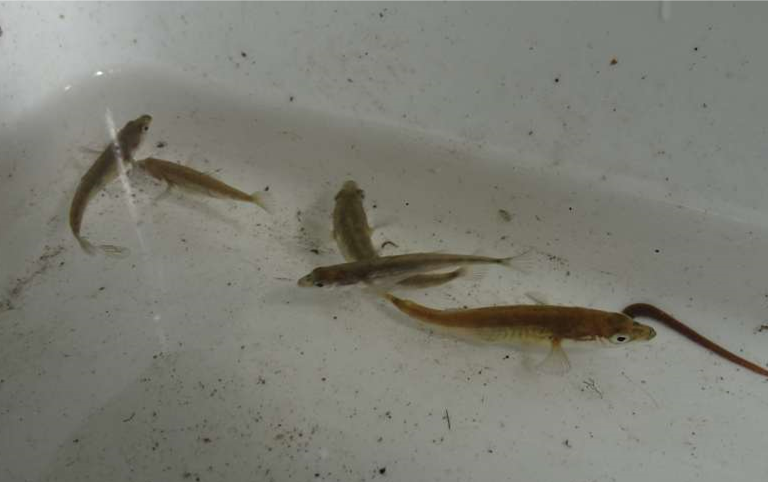 Some sticklebacks and the leech explore the white tray. Moorhen with three chicks seems oblivious to the scum that can’t impede their swimming. 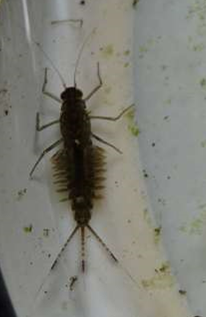 Some daphnia-like fleas were also found together with midge larva and a three-tailed nymph but I couldn’t decide if this was a mayfly or a damselfly. Although spring and early summer are best for wildflowers there is still quite a bit of colour in early August. I visited on a sunny day (260C), 7th August, and saw the oblong, pale lilac flowers of spearmint. 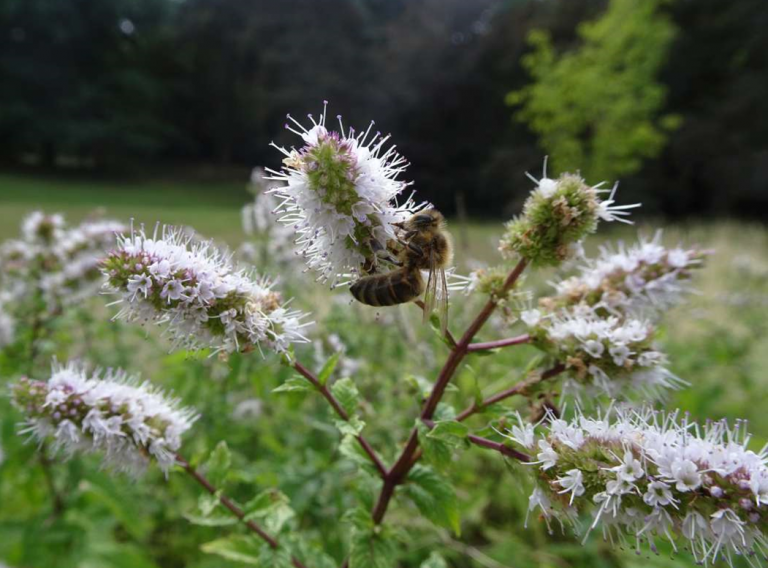 By the lake, the water mint has similar but rounded flowers. 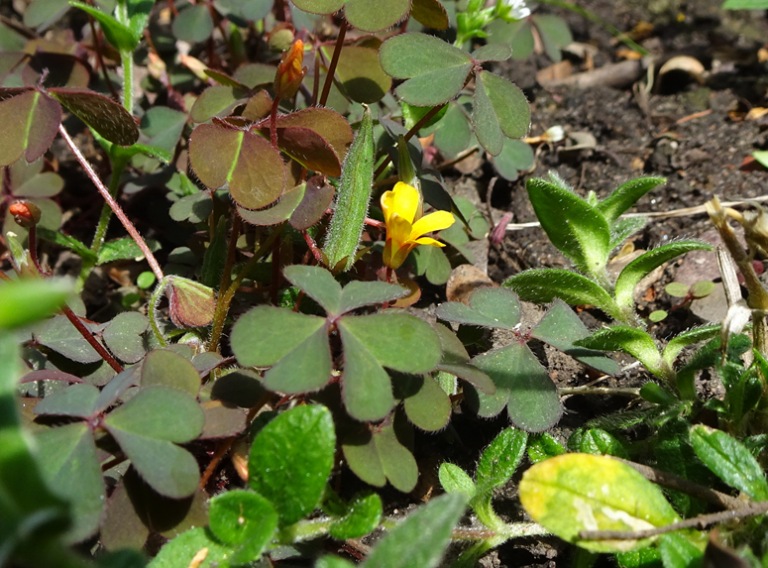 There was also creeping sorrel in the gaps in pavements and rough areas, and goldenrod by the lake. 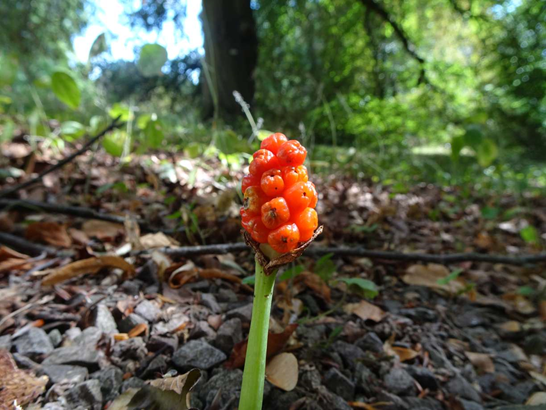 The bright red berries of lords and ladies were under the beech tree and in wooded areas. 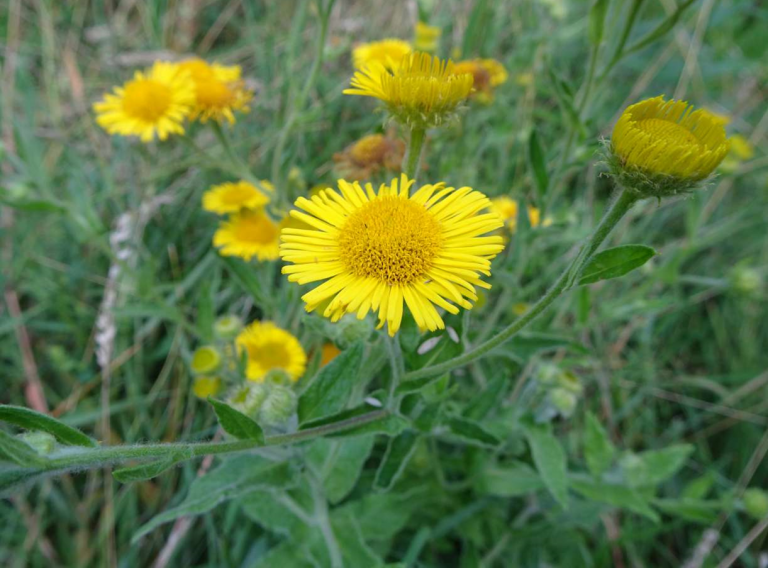 The perennial sowthistle is characteristic of late summer. 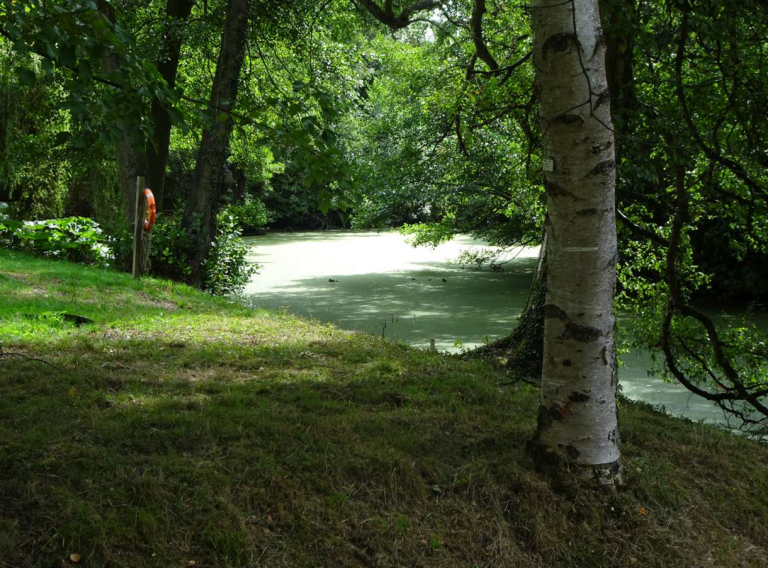 It is seen here by Woodbrooke’s lake. 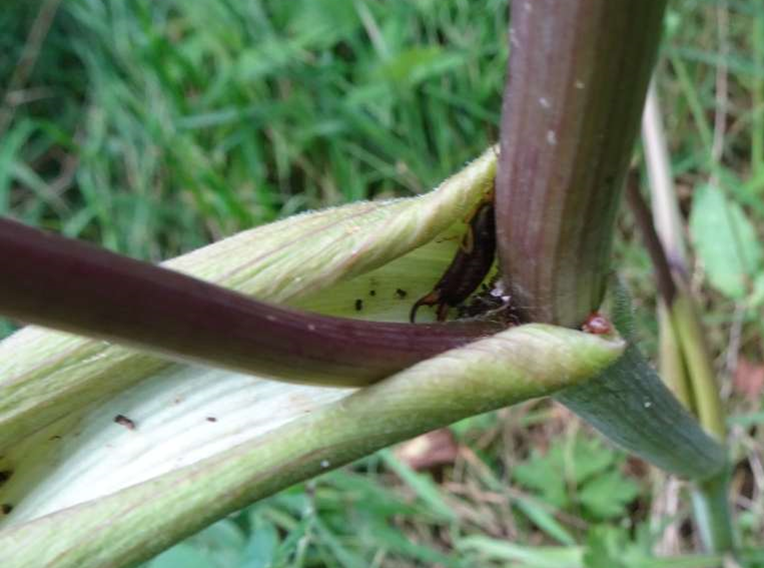 An earwig snuggled down in the bract of wild angelica. The summer heat has now moderated and there has been some rain. Everything looks green again at least for a brief time until the leaves of some trees will take on their autumn colours. I visited on the 3rd and then again on the 18th of the month. Both days were quite warm 20 – 220C and the partial cloud was giving way to sun. On the 18th there had been rain earlier and there were still strong winds after the recent storm. 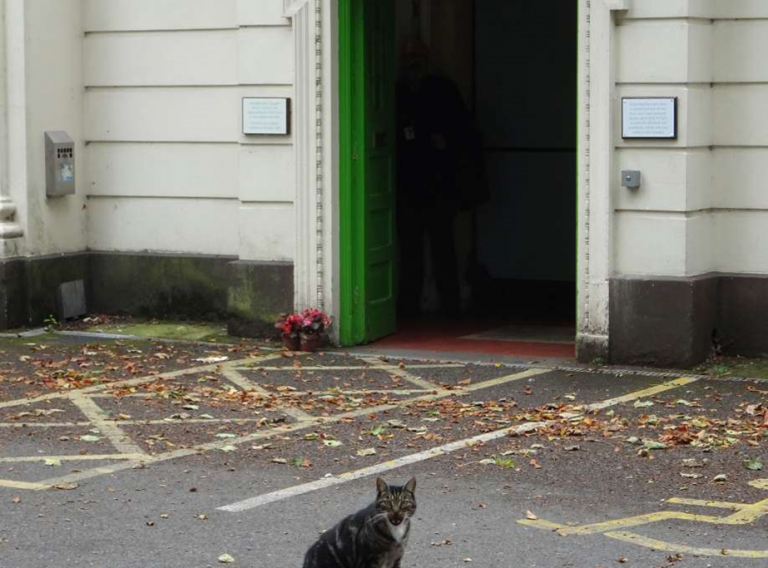 On the second visit, I was greeted in the car park at Woodbrooke’s entrance by Dennis, an exceptionally friendly cat, whose humans live in a private house on Woodbrooke’s grounds. He is not exactly part of the wildlife but, as a bold hunter, I guess he has an impact. Cyclamen (cyclamen hederifolium) on the woodland floor. 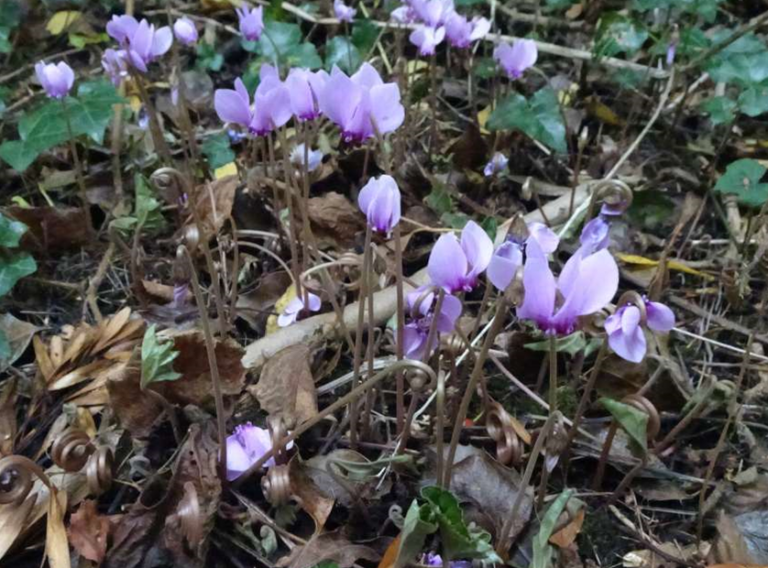 Most of the flowers have now gone over but the cyclamen brighten the woodland floor. 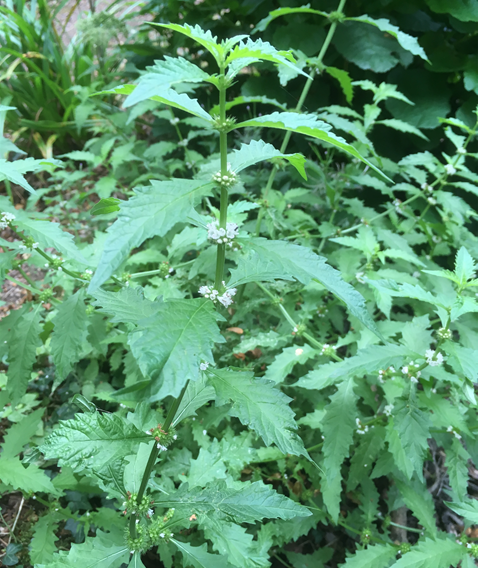 Gipsywort, with its little white whorls of flowers, is another late flowerer. This turns up by the lake. It likes to be near water. 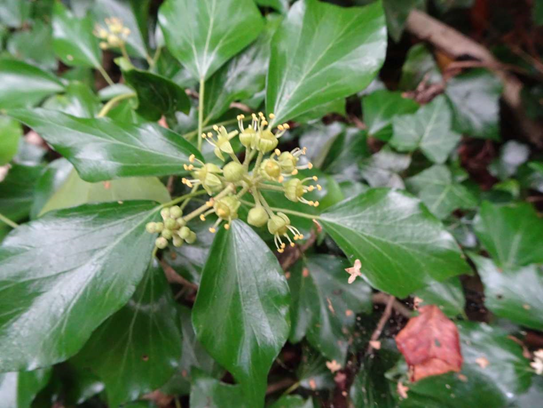 The ivy is also in flower. 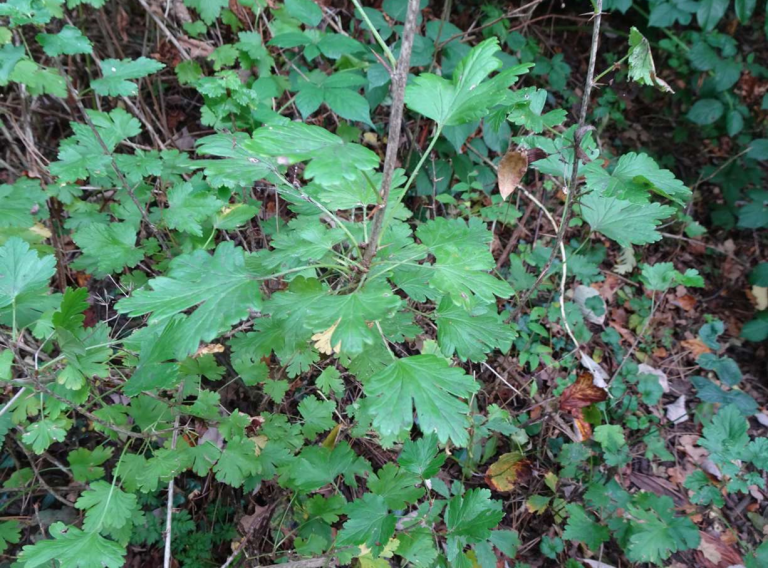 The shady areas host the trowel-shaped leaves on flowering stems and the typical ivy-shaped leaves that are on non-flowering stems. 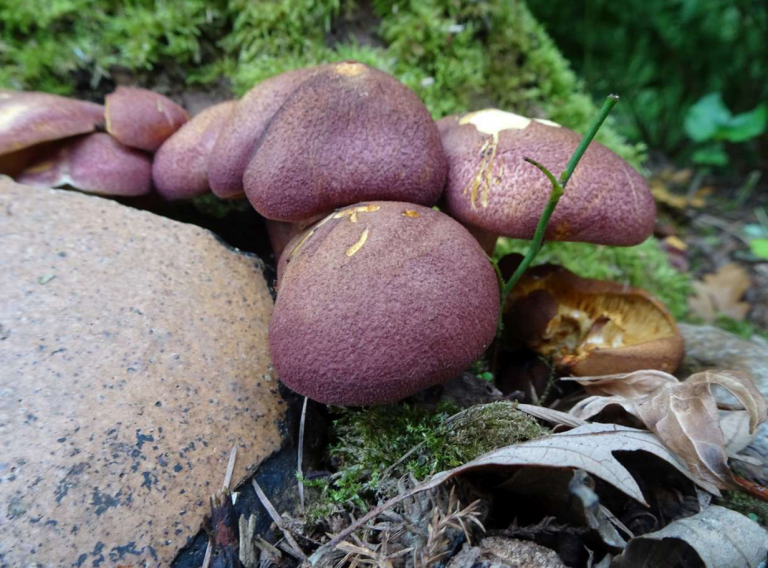 Plums and custard (Tricholomopsis decora) at the base of a coronet-pruned pine stump. They typically grow with old pine wood. These toadstools were growing on a pine stump near the cloud hedge. 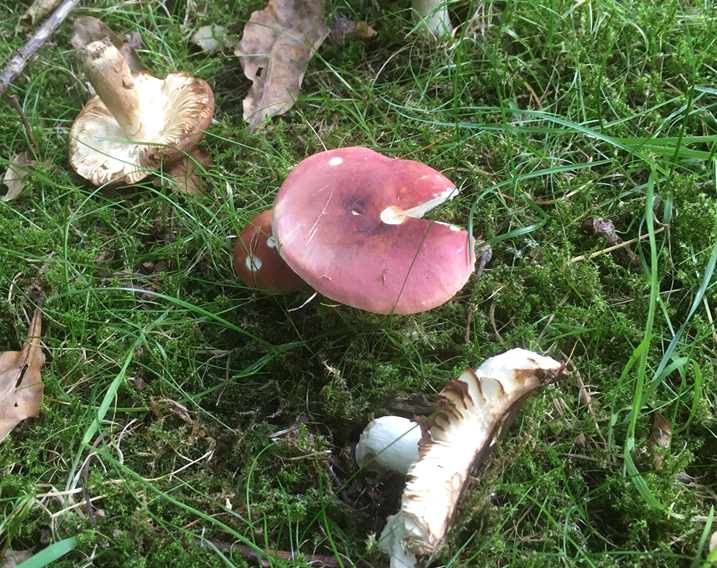 Another purple capped toadstool is the purple brittlegill (purple russula). 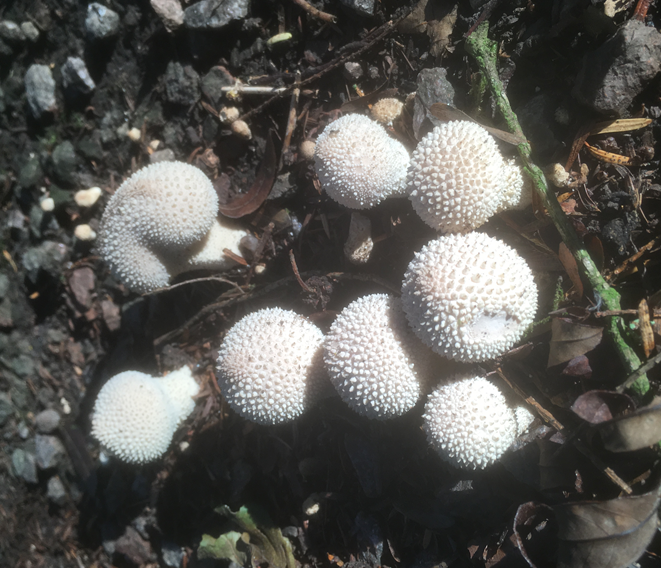 I think this is the fungus that I found growing near the oak tree at the back of the Art Room. There are a lot of reddish/purple brittlegills but, because my Collins’ fungus book says this one is widespread and very common, I’m assuming this is what I’ve seen at Woodbrooke. On the 18th, the adult moorhens were still about but there only seemed to be one chick. Apparently, a fox has been seen in the evening. Perhaps Felis catus, Dennis, is not to blame. The lake now has some clear water but the chick still managed to find a nice scummy patch. 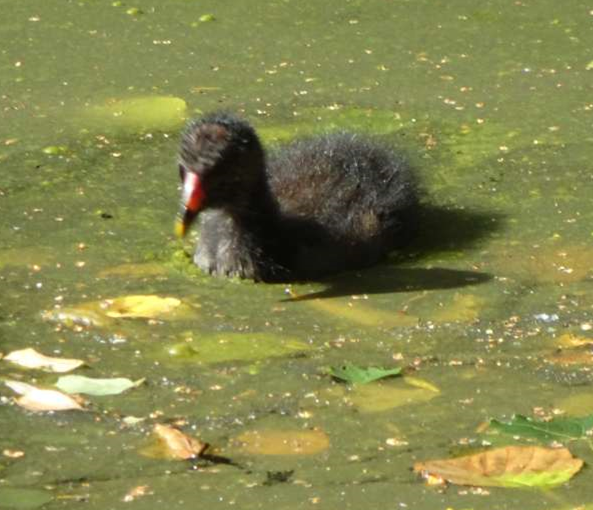 A moorhen chick now more independent. 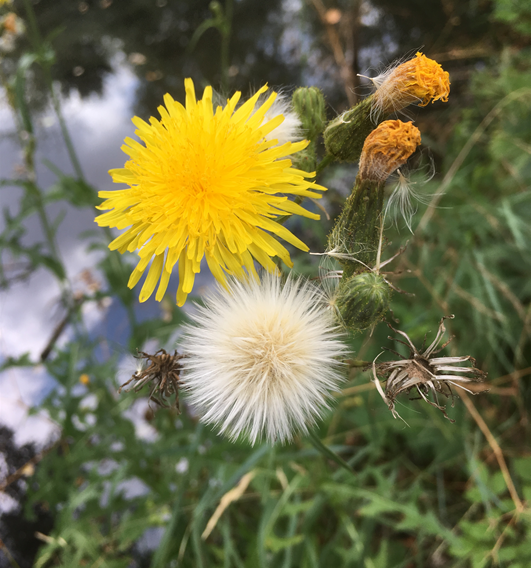 Now that the wildflowers have mostly finished flowering, there are several berries to be seen such as blackberries,elderberries and snowberries. The snowberry, for me, is associated with gardens but my flower book says it is naturalised in Britain. Blackberries in the hedge bordering the grass at the north of the site. Ferns, of course, are not so much associated with a particular season. 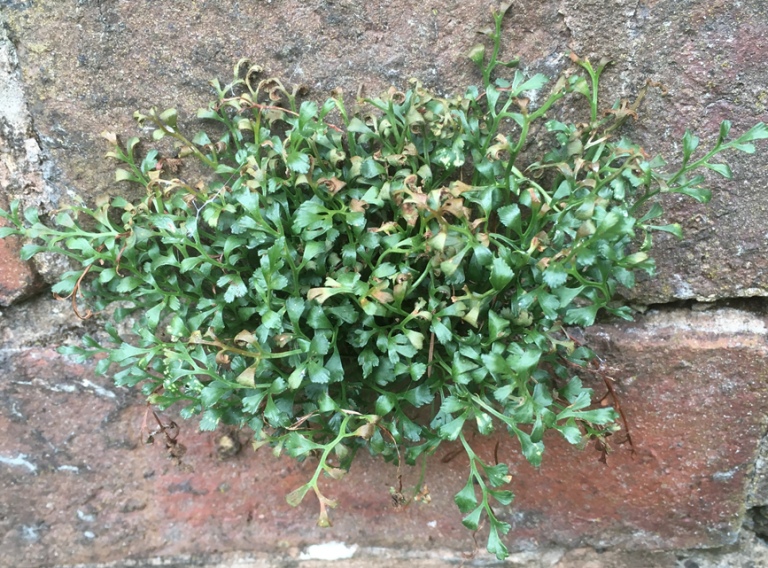 The wall rue on the wall around the walled garden seemed to be doing well in spite of the dry summer. 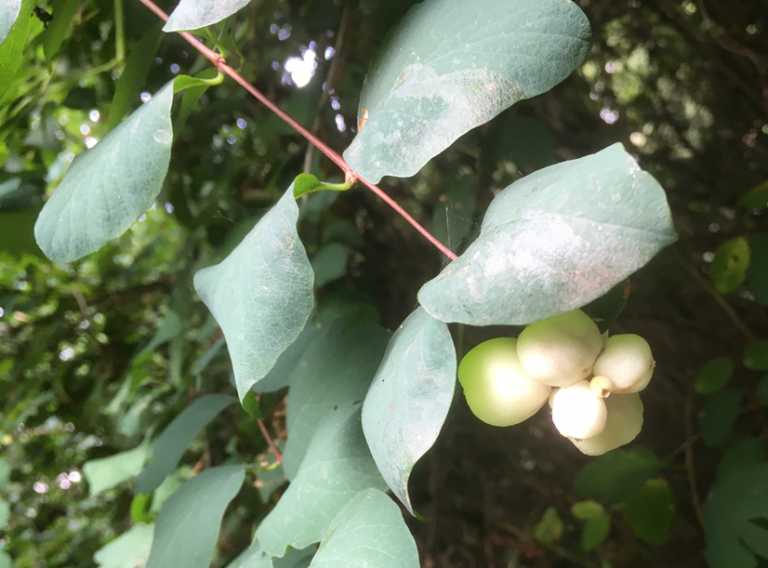 Snowberry (Symphoricarpos albus) in Woobrooke’s woodland. Visits on sunny days at the beginning of October (4th) and on the 23rd offered splendid sights. 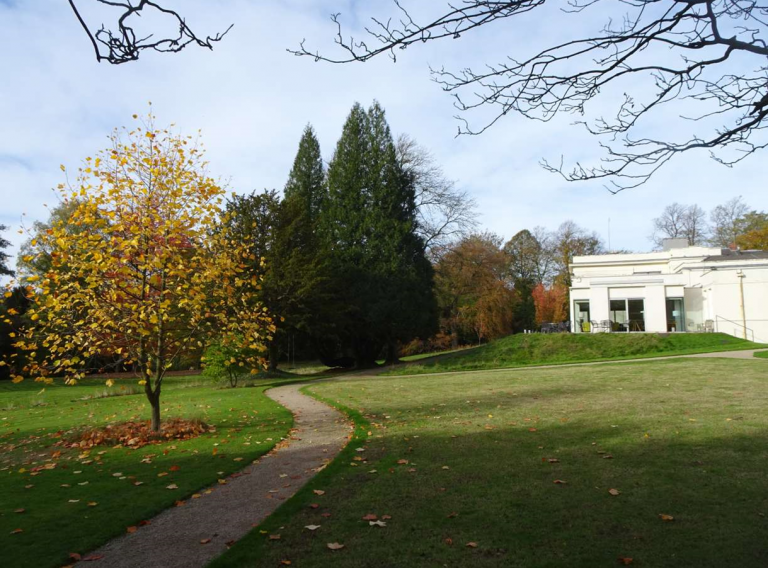 Woodbrooke’s garden was ablaze with autumn colours. Some the trees were “on fire” with red, yellow and orange. 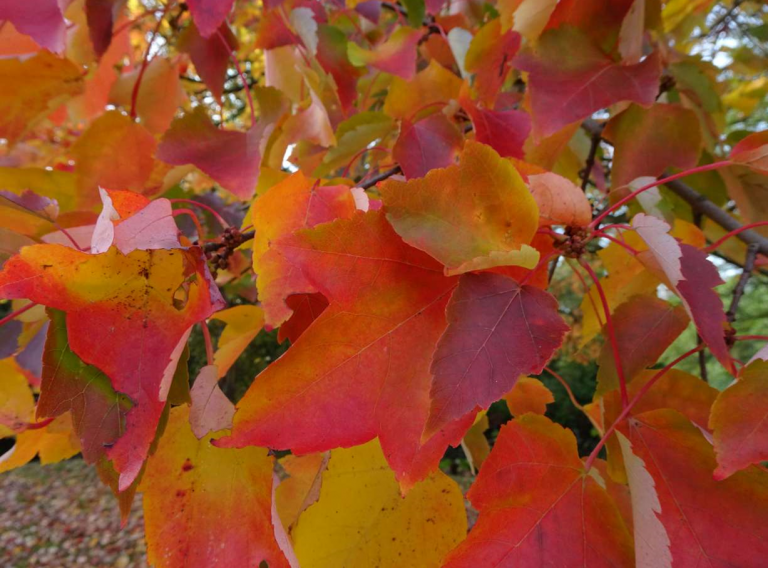 The specimen trees showed off leaves that are special for red and yellow glows. 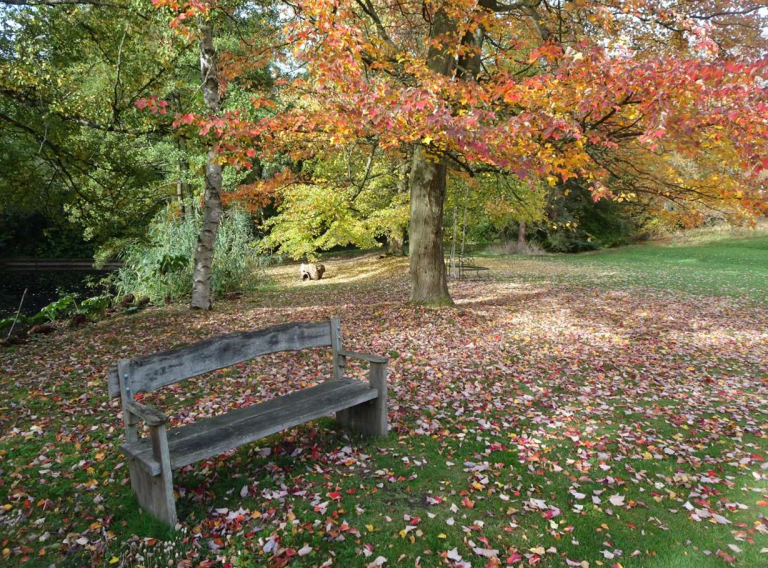 The red maple (left and below) had branches with a bright livery and when the leaves dropped they made a wonderful carpet by the lake and the wooden seat. The tulip tree above has large green leaves that turn yellow in Autumn. 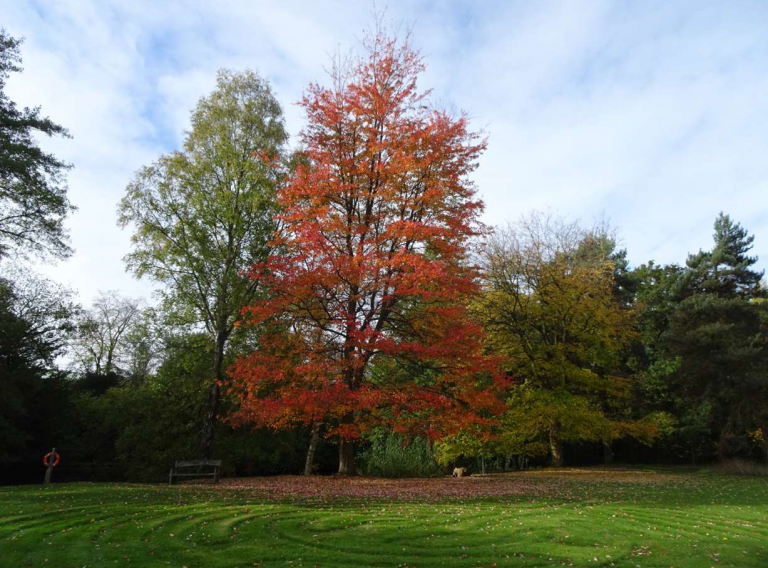 The red maple (Acer rubrum) on the north bank of the lake behind the labyrinth was at its colourful best. The tulip tree (Liriodendron tulipifera) is on the lawn by the path to the lounge. 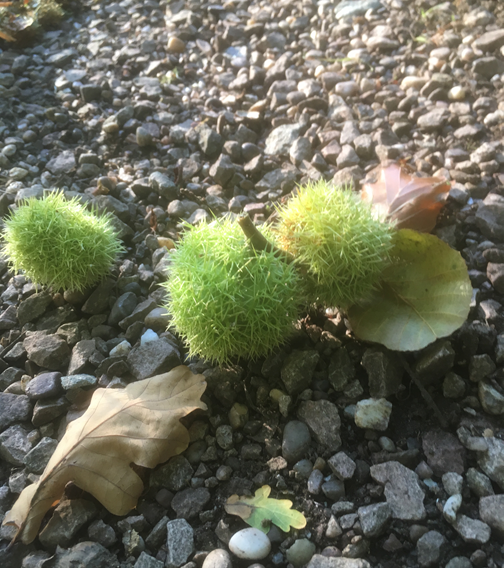 It is not all about special trees and their leaves. 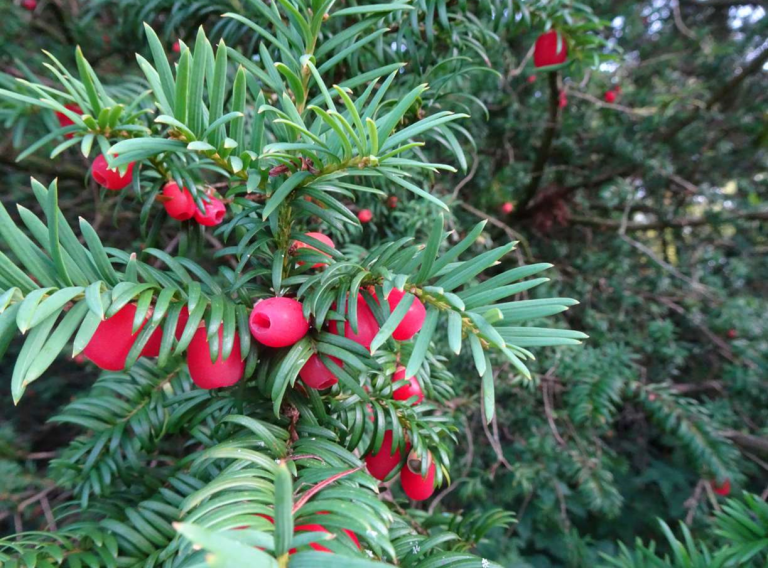 Native trees were producing berries and nuts. Most of the wildflowers have packed up for the winter. One or two are hanging on but the autumn crocus (also known as meadow saffron), chooses October for its late flowering effort. It seems to come straight from the ground and is rather floppy. This flower was under the ash tree by the Quiet Room. 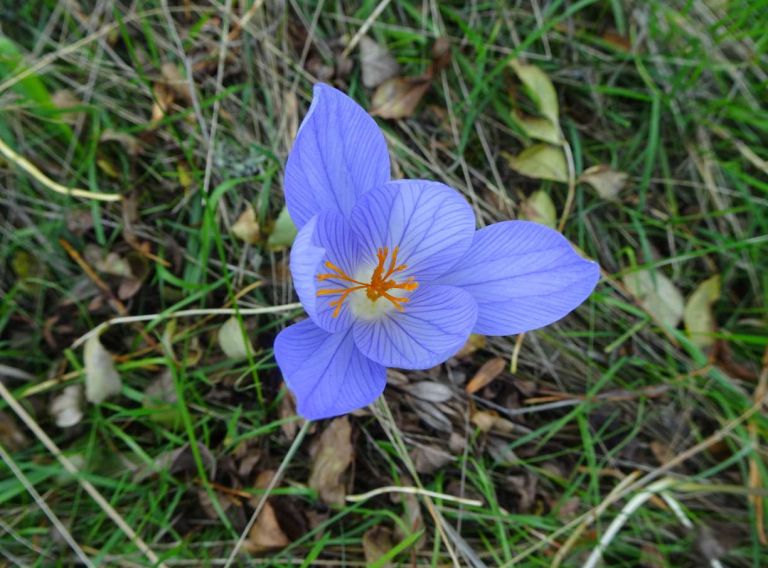 It was probably planted but meadow saffron is also found wild in Britain. Meadow saffron or Colchicum autumnale is not strictly a crocus but looks very similar. 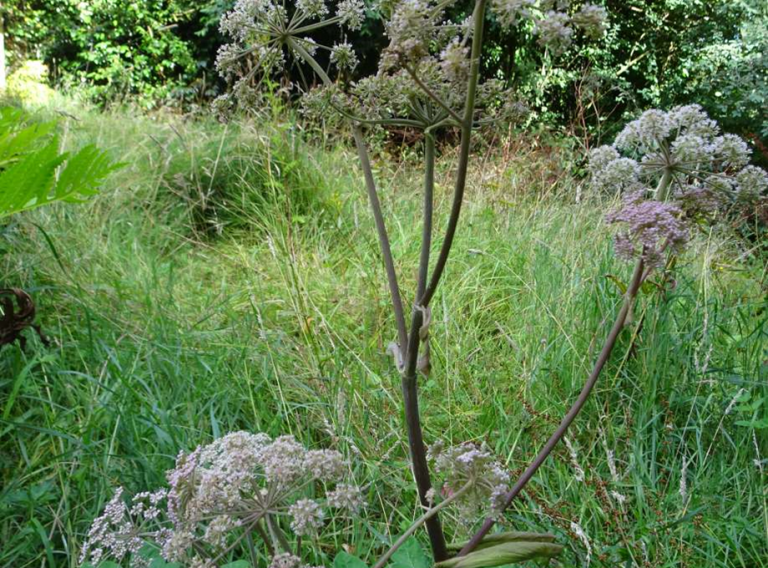 The plant is very poisonous. The symptoms of colchicine poisoning resemble those of arsenic and no antidote is known. 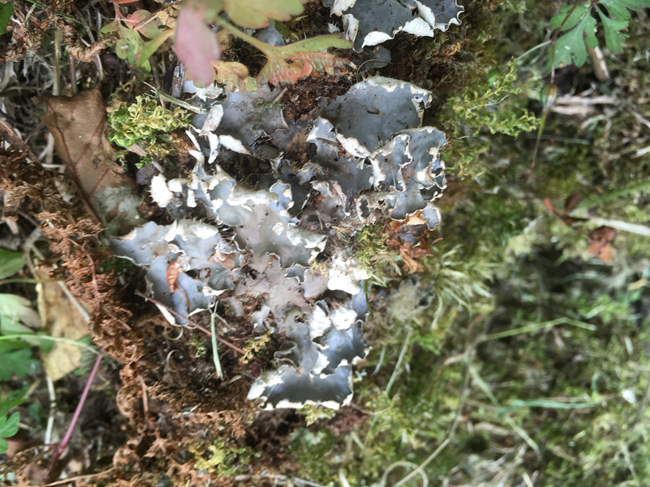 October is a month for fungi rather than flowering plants. 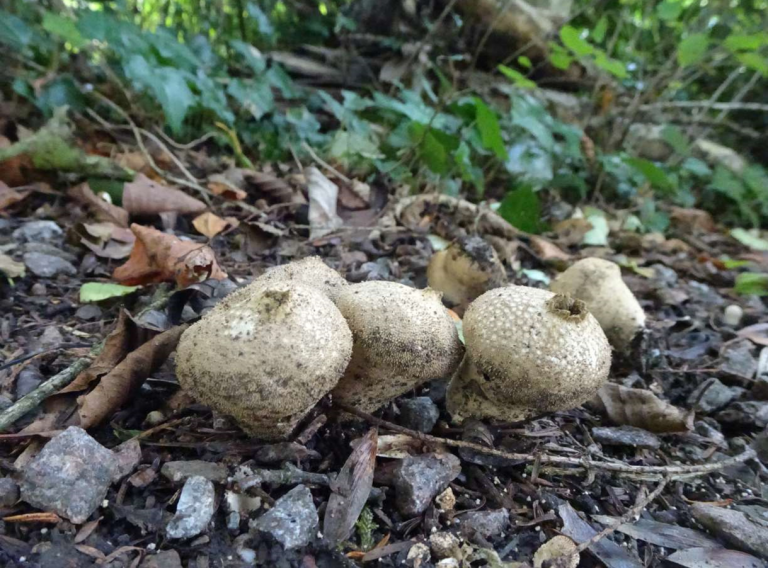 The common puffballs on the path to the south of the lake were young and fresh when I visited on 4th October but they were old and belching out spores on the 23rd. for a “walk” after I’d sprinkled a bit of water on it to arouse it from its resting state. Although some fungi were in evidence, I wasn’t expert enough to name most of them. Common inkcap Coprinopsis atramentaria, or inky cap, is an edible mushroom found throughout Europe. Sometimes it can cause stomach upsets when combined with alcohol hence another common name — the tippler’s bane. 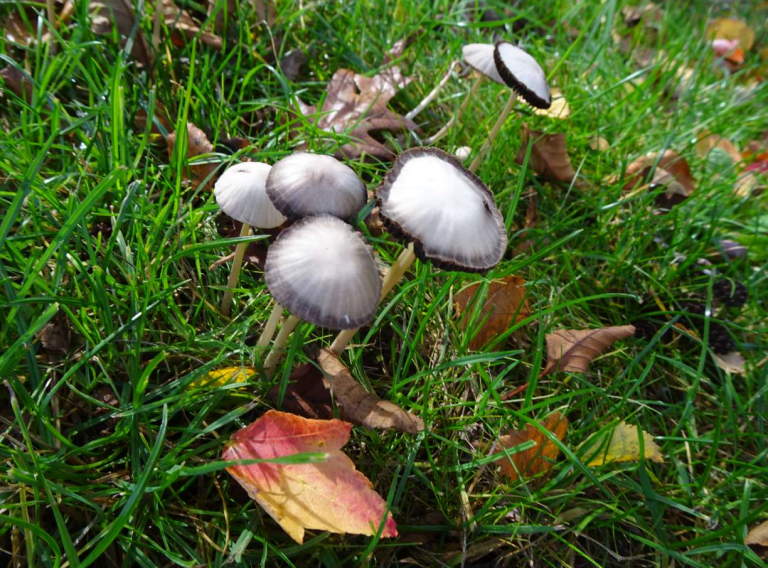 Some common inkcaps (I think) on Woodbrooke’s lawn. In the woods to the east of the site and just south of the fire circle, I came across some bushes that looked like gooseberries. The leaves were fresh and green but there were no fruits. 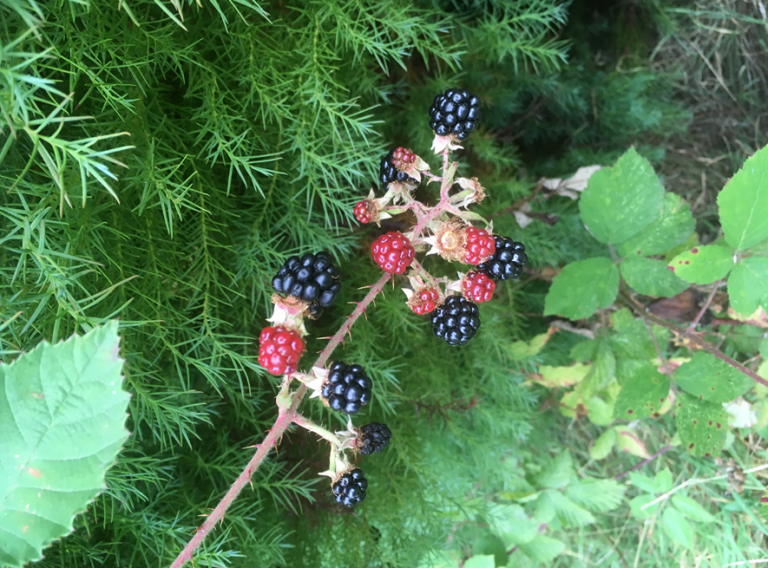 I must make a note to myself to check in July next year to see if there are any berries. I have found gooseberries growing wild but I suspect Woodbrooke’s bushes are planted or at least direct descendants of deliberate plantings.